All Trawler Owners, Captains and Crew (draggers, shrimpers, whiting) - you are invited to attend one of our local port meetings. We'll buy lunch and give you information on a new cable coming offshore from Pacific City. Cable route thumb drives will be distributed. 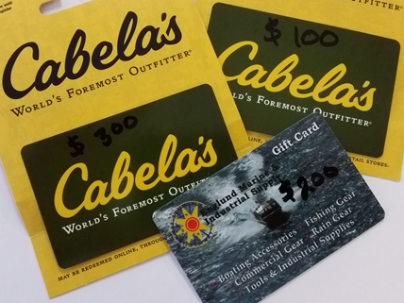 Enter drawings for $300, $200, and $100 gift cards from Cabela's and Englund Marine Supply. GPS EPIRB Grand Prize from SubCom. Drawings March 27 include all entries. All meetings will start at noon. 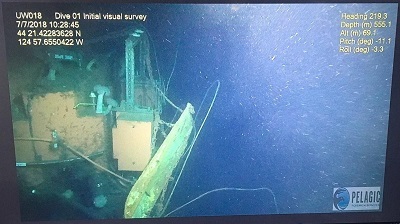 On July 7th the RV Bold Horizon, using a small Remote Operated Vehicle (ROV), successfully recovered fishing gear and the sub-surface platform the gear was fouled on. The science platform, part of the Ocean Observatories Initiative, was struck by trawl gear on September 16, 2017, disabling the platform and the shallow-water profiler that was onboard. Pelagic Research Services, which was contracted to recover the platform and gear, found the platform and a trawl door about 38 fms off the bottom in 304 fms of water. OFCC Board member and fisherman Gary Wintersteen assisted with the recovery. Photos courtesy of Gary Wintersteen. More photos and video are available on our Facebook page. OFCC Version 10 is available for your plotters adding the as-laid NCP Cable and Hawaiki Submarine Cable routes. They were installed off Pacific City in May and October/November 2017. V10 thumbdrives will be distributed at Port Meetings or stop by the OFCC office at 2021 Marine Dr., Suite 102; email: staff@ofcc.com; or call (503) 325-2285. Facebook joined the OFCC on June 20, 2018, becoming the ninth submarine cable owner, joining General Communications, Inc. (GCI), Alaska Communications (ACS), Verizon, Tata Communications, Woods Hole Oceanographic Institution, GU Holdings Inc. (Google), Microsoft Infrastructure Group, LLC., and Hawaiki Submarine Cable USA LLC. Facebook is one of the consortium owners of the Jupiter cable system. The Jupiter system will land in California and in Oregon. The Oregon landing of the Jupiter system will be in Pacific City. Jupiter will cross the Pacific Ocean to Japan and the Philippines, a total length of 4,860 nm. The cable has a design capacity of 60 Tbps. SubCom will be manufacturing and installing the Jupiter cable. They are targeting late summer 2019 for installation off Oregon. Facebook worked with the Oregon fishing industry to get the best route crossing the shelf and slope. At least one OFCC vessel will be needed for patrol boat duty ahead of the cable ship during installation. Additional vessels may also be needed for patrol or guard boat services during the installation period. OFCC member vessels that have submitted a Statement of Interest are entered in a random drawing for each cable project. Vessels that haven’t served in a cable installation under their current owner are given priority. Vessels must be in seaworthy condition as determined by the OFCC and required equipment needs to be in good working order and on board prior to mobilization. Patrol vessel charters are usually up to 10 days and the current rate is $57.50/foot/day up to a maximum of $4887.50 per day (85 ft). To become a member or for more information, call (503) 325-2285 or email us at: staff@ofcc.com. 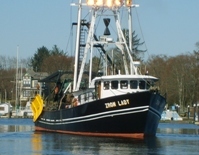 The Oregon Fishermen's Cable Committee is an association of concerned Oregon commercial trawl fishermen who have negotiated cooperative agreements with fiber optic cable companies to protect the integrity of the fiber optic network and the fishing grounds. Since its inception, the committee works to follow the goals of its charter - to facilitate communication, coordination and cooperation between the fishing industry and the submarine cable industry and to inform the fishing fleet of appropriate operation procedures.